Gas Sensors Market size was valued at over USD 2.5 billion in 2017 and will grow at a CAGR of over 3% from 2018 to 2024. The global shipments are expected to exceed 1.5 billion units by 2024. Rising popularity of miniaturization of electronic devices & components is driving the utilization of gas sensors market products. These components are mainly consumed for integration in real-time environmental monitoring systems across several industry verticals. A high reliability and long component life are benefits that add up to an increased consumption of these products across the globe. Additionally, stringent government and industrial regulations for worker safety from gaseous and chemical emissions in industrial settings are generating several opportunities for the industry growth in recent years. Harmful impacts of gases from manufacturing activities that include respiratory diseases and other health problems create the need to deploy monitoring systems that further increase the gas sensing component consumption. Increase in the demand for smart and wireless gas sensing components to be deployed for various systems including chemical detection & air quality monitoring is accelerating technical developments in the gas sensors market. Smart sensing technologies offer better detection of chemicals and hazardous substance and offer improved performance benefits over conventional sensors. Moreover, the need for quick and continuous air quality monitoring in infrastructures including industrial, commercial, and residential settings is a key factor contributing to the expansion and deployment of these products. Smart gas sensing components find applications in smart cities, smart factories, etc. due to improved efficiency over conventional components. For instance, in March 2017, AerNos announced the launch of its specialized nano gas sensors for detecting harmful gases and integration with IoT devices in smart cities. High costs associated with innovative & advanced products are hindering the gas sensors market demand. The cost factor restricts the deployment of gas sensing components in low-cost consumer electronic applications. Due to fluctuations in raw material availability and their increasing prices, the cost of the final product increases, further hampering the market growth. This issue can be overcome by improved supplier-manufacturer relationships and the use of low cost & eco-friendly components. Infrared technology in the gas sensors market is growing at a CAGR of over 5% owing to longer product life benefits over other sensing materials such as electrochemical & PID. These sensors find applications in various industries including food & beverage and healthcare for detecting harmful gases at production facilities. The technology offers improved performance efficiency for hydrocarbon gas detection and is deployed in hydrocarbon detectors. Infrared technology offers fail-to-safe operations due to the presence of optical and sensor communication features. Non-dispersive sensors are increasingly used due to easy maintenance, simple design, and easy operations. Semiconductor-based sensing components are experiencing substantial growth in the gas sensors market due to an increased use in air quality monitoring systems. The technology provides accurate measurements and detection of nitrogen oxide & ozone concentrations in urban environments. The growing popularity of these components is due to metal oxide semiconductor sensors used in environmental pollution measurement. These types are increasingly in demand across various industries owing to their benefits including good performance in high humidity conditions and mechanical robustness. However, certain issues that include the inability to perform at certain temperatures and technical drawbacks hamper the market development. The wireless gas sensors market is expected to witness lucrative expansion over the forecast timeline due to applications in various environmental monitoring systems. The growth of these products is attributed to the elimination wired connections and cables that further reduces the system complexity. Deployment of wireless products incur low installation cost benefits and save the space required as compared to the wired alternatives. Companies operating in the industry are developing innovative wireless solutions that include detectors, monitors, and controllers for efficient gas monitoring. For instance, Sensidyne offers its SensCast wireless gas detection solution that is used for continuous and multi-point gas monitoring operations. The oxygen gas sensors market is expected to reach over USD 760 million due to various applications in laboratory and climate control for indoor environments. They form a major part of the automotive industrial applications owing to their deployment in systems including port fuel injection and cylinder engines. It provides several benefits such as enhanced engine performance, reduced exhaust emissions, etc. to automobile systems. Automotive component suppliers have developed specific gas sensing components for in-vehicle deployments. For instance, Bosch Auto Parts offers a variety of oxygen sensors that include premium and universal components that comply with the OE specifications. Carbon monoxide products in the gas sensors industry are growing at a high pace owing to the growing popularity among healthcare applications. They are integrated into detectors that are used to monitor gaseous substances in medical arrangements. These sensors provide point-of-care monitoring and physiological parameters in the patient disease detection operations that are further accelerating product developments. These products are increasingly being deployed in residential infrastructure to detect carbon monoxide content in the in-house environment as a result of increased environmental pollution across the globe. Key companies in the market offering these products include Aeroqual, Siemens, ABB Ltd., Bosch, etc. Consumer electronic applications in the gas sensors market was valued at over USD 150 million, which is expected to significantly be attributed to their implementation in various advanced and connected devices such as wearable devices, smartphones, etc. Environmental sensing with the help of such devices is a major trend generating the demand for gas sensing components across the globe. Moreover, advancements in consumer electronic devices that provide weather forecasts, altitude tracking, and indoor air pollutant information are further creating several opportunities for the market growth. With the integration of IoT and environmental sensing technology, these devices are used in smart home systems and other similar facilities including schools and offices. In the gas sensors industry, medical applications are witnessing a substantial growth due to their use in medical diagnostics, treatment, and monitoring systems in healthcare facilities. These sensing components find several other applications in medical devices such as ventilation, anesthesia, drug delivery implants, smart inhalers, etc. Companies in the gas sensors market have developed medical application specific sensing technologies that support various patient detection systems. For instance, Sensirion AG offers a variety of products for medical applications deployed in several systems used for e-health, metabolic measurements, point-of-care diagnostics, etc. 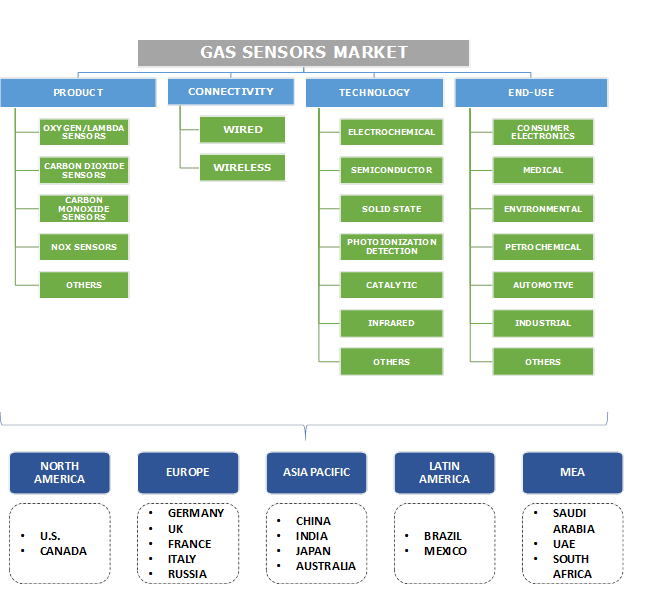 North America gas sensors market will experience growth in terms of unit shipment to reach over 550 million units due to the presence of several governmental regulations that support the protection & safety of workers in manufacturing facilities of various industries. The growth in this region is attributed to an early adoption of technological advancements and the high consumption of smart & connected devices across various industry verticals. Additionally, the presence of leading sensor manufacturers in the U.S. is further generating prospects for gas sensor market development in the region. Rapid developments in the automotive industry across Europe and North America account for several opportunities that increase the consumption of gas sensing components in automotive systems. Key players operating in the gas sensors market comprise Amphenol Corporation, Bosch Sensortec, Sensirion AG, Siemens AG, Aeroqual Ltd., Honeywell International Inc., Yokogawa Electric Corporation, Figaro Engineering Inc., Dynament, Teledyne Technologies Inc., etc. Several companies are developing product innovation strategies that include launching application-specific sensors for consumer electronics, automotive, and healthcare industries. Leading players in the market also focus on investing and improving their R&D capabilities to offer the latest technologies in the gas sensors industry to gain a competitive advantage. For instance, in June 2017, AerNos announced its partnership with Rogue Valley Microdevices to develop tiny and affordable gas sensor components for personal air monitoring applications. 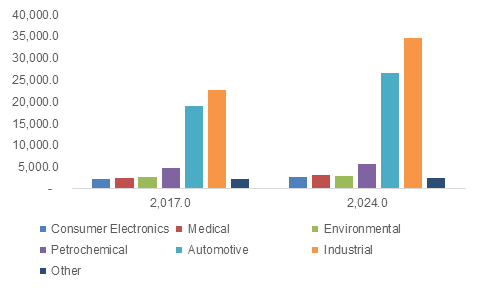 Technical advancements such as development of the connected sensing technology to be utilized in IoT-based devices is driving the gas sensors market growth. The industry comprises several established players across the globe that have strong manufacturing and distribution capabilities. Furthermore, the presence of stringent laws and rules associated with the expansion of environmental monitoring systems impacts production activities. Industry players have developed strong partnerships and collaborations with the leading automotive manufacturers to address the high demand and strengthen their presence. Increased demand from the consumer electronics segment has enforced manufacturers to develop products that fulfill the requirements of IoT advancements in such devices.